The Unofficial Minecraft Adventure short stories. Explore the mysterious world of Steve and be thrilled by the exciting adventures that await our hero and his dog companion, Growls! Steve is pretty sure he has what it takes to be a hero. However, after cryptic things started happening, Steve began questioning himself. What if he’s not really meant to be a hero? What if all he had been doing actually didn't count as a heroic deed? Has he been just fooling himself in believing he’s actually a hero? With the mysterious human luring him into playing a mysterious game, could he really survive? What is it that awaits him as the game commences? 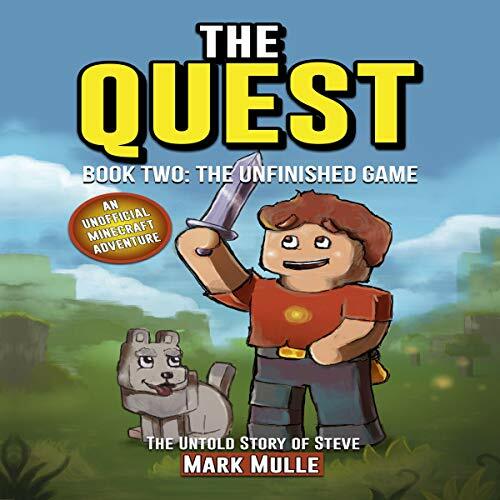 Once again, here’s another adventure story from Mark Mulle, one of Amazon’s best-selling authors. Grab this audiobook now and join Steve as he seeks out the real purpose of why the mysterious human is haunting him. This unofficial Minecraft audiobook is not authorized, endorsed, or sponsored by Microsoft Corp., Mojang AB, Notch Development AB, or any other person or entity owning or controlling the rights of the Minecraft name, trademark, or copyrights. All characters, names, places, and other aspects of the game described herein are trademarked and owned by their respective owners. Minecraft®, TM, and ©2009-2016 Mojang/Notch.